I have been itching to post about this work since David DiGregorio presented it at a meeting at Janelia last year. 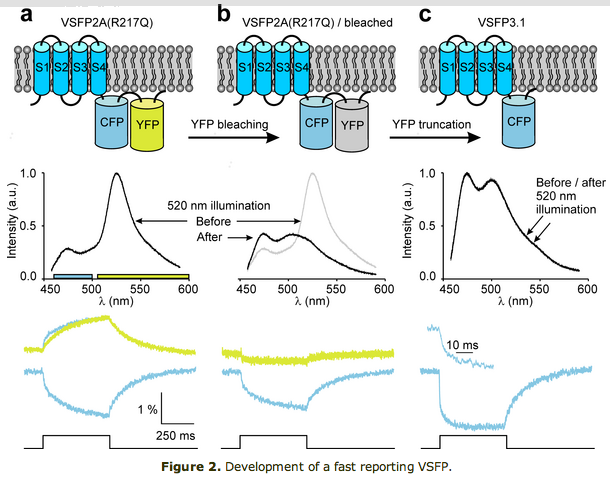 His group’s results, Submillisecond Optical Reporting of Membrane Potentials In Situ Using a Neuronal Trace Dye, were published in the Journal of Neuroscience last week. Their method of optical voltage sensing is the first one that looks like its ready for “prime-time” action outside of the labs of developers of these sorts of techniques. 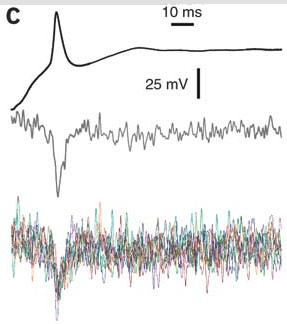 It has sufficient speed (<1 ms resolution), sensitivity (25% dF/F per 100mV), and limited membrane perturbation to see single action potentials, without dramatically altering the shape of these currents. Membrane depolarization causes DPA to rapidly partition to the inner membrane leaflet, quenching DiO. Like previous methods, Bradley et al. 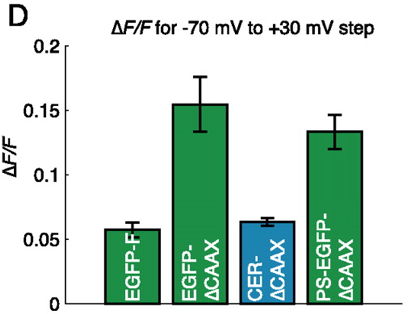 use voltage-dependent membrane partitioning of dipicrylamine (DPA), a charged small molecule, to quench a fluorophore via FRET. Previously, high-concentrations of DPA were required to have a reasonable signal change, which caused toxicity, increased membrane capacitance and slowed voltage transients. 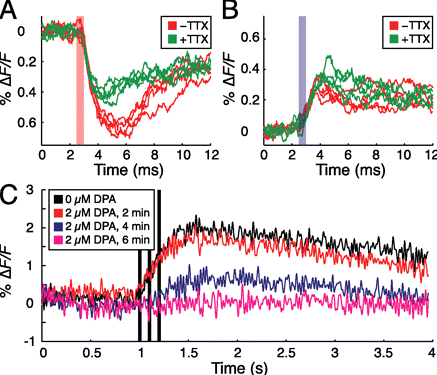 By using DiO, a lipophilic neuronal tracer, as the fluorophore, the DPA concentration could be reduced to 1uM, while retaining sufficient optical sensitivity for action potential detection. 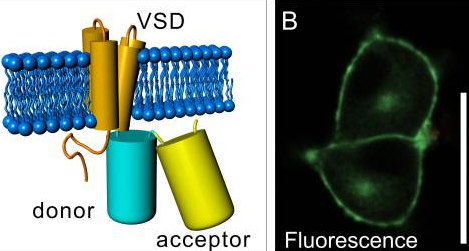 Cell has an interesting article on the benefits and the technical challenges associated with pretty movies that illustrate cellular events. When done well, these really help remind me of the scale of cellular components and their interactions. Here is a short snippet from the text. Although animation is a powerful tool that lets one dissect the chronology and mechanism of a multistep process, how do we depict the variety of molecular motions that occur on drastically different timescales within a single movie? Thermal motion of individual atoms (10−15 to 10−12 s), amino acid side chain motions (10−9 s), diffusional events (10−6 s), transient conformational changes and folding (10−6 to 10−1 s), and large conformational changes all contribute to our understanding of molecular function. When one also considers the timescales relevant to processes in cell biology (1 − 102 s), we are faced with a daunting range spanning 17 orders of magnitude! The article also has the most comprehensive collection of links to cool molecular visualization movies, which are also appended below.